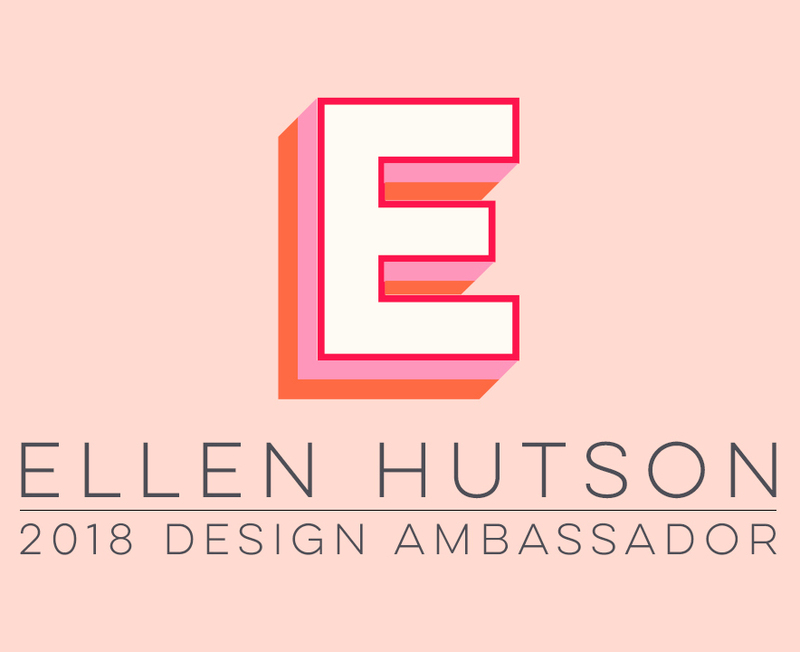 Today Ellen Hutson designers are joining the Pattern Happy designers for a blog hop celebrating Pattern Happy products arriving at the Ellen Hutson shop! You will love these fun and playful clear stamps and coordinating dies, as well as their awesome 6x6 patterned paper packs! To create the popsicles, I stamped them with Memento Tuxedo Black ink onto delicious patterns of paper from the Rainbows 6x6 patterned paper pad, then cut them out and glued the pieces onto an additional stamped and die cut white cardstock popsicle. The far right popsicle's stamped dots were colored in using the rainbow Copic markers shown below in the supply section. The popsicles were popped up with foam tape onto a white panel die cut with stitched scallops. The wonderful sentiments were stamped with Hero Arts Bold Ink Cubes (Orchid and Rose Madder), and Black -- aren't those fonts fresh and fun?!! To finish the card, I popped up the white panel on top of a white top-folding card base that has a bold black and white patterned strip of paper from the Pattern Happy 6x6 Color Me paper pad along the bottom edge. I simply colored the top edge of the card base using the chisel end of a Black Copic marker. To give the card lots of luscious sparkle, I coated the popsicles and "coolest" and "sweetest" sentiments with Nuvo Aqua Shimmer pen (hopefully you can see all the wonderful shimmer in the photo above!). Please visit the blogs of these awesome designers on today's hop, to see more inspiration using Pattern Happy products! For additional inspiration, you can also visit Ellen Hutson's the CLASSroom blog or the Pattern Happy blog. Not only do we have bunches of inspiration, we have prizes! Make sure to leave comments at each stop on the hop for a chance to win one of two Pattern Happy prize packs! Leave your comments before April 5th, at 11:59pm PST. Winners will be contacted via email. Thanks so much for joining us today! I used a 6" square piece of X-Press It Stencil Sheet (made of thick vinyl with repositionable adhesive on the back). Or another great product to make the template with would have been Ellen Hutson's Art Magnetic Masking Material -- especially with use in the magnetic MISTI! Note: You will need to use the original MISTI if using a 6-inch square template, as the 6-inch template will not fit into the Mini MISTI. Then I cut two 4-inch squares in the stencil material, using my paper trimmer (I used a 4-inch cut piece of cardstock as a guide and drew pencil lines around it). Of course, you can make the template as large or small as you'd like. I was hoping to use square dies to make the process a bit more simple, but none of my square dies were as large as 4 inches! Anywho ... just make the two squares at 45-degree angles to each other! Place a 4-inch piece of cardstock inside the template in your MISTI. Position a stamp onto the paper where you would like to start forming your circle (I started stamping the pink flowers above first, and aligned it in the upper left corner of the paper in the template). Pick the stamp up with the lid of the MIST, ink it, then stamp. Rotate cardstock 45 degrees, so it is now in the next corner of the template; stamp. Repeat turning the cardstock and stamping until the circle is complete. To complete the design, I stamped the small black spray flower and black dots separately using the template. To finish this card, I matted the 4" stamped piece with black cardstock and mounted the piece onto a red 4.25" card base. The red flowers were glittered with the Nuvo Aqua Shimmer pen and three clear sequins placed in the flower centers. I hope you will give this technique a try. I'm sure glad I did, because it was tons of fun! Good Friday to you, Peeps ... I'm back with some more Easter card inspiration today! Thanks so much for joining me today ... Wishing you a wonderful weekend and Happy Easter next week! Happy Friday, friends -- Today I'm sharing a Quick Bunny window Easter card! These adorable Memory Box Quick Bunnies from the new 2018 Spring Release fit perfectly around the Grass Stitched Circle Frame! I simply die cut a circle out of a lavender notecard about the same size as the stitched frame opening, then glued the frame on the card front. Of course, the bunnies needed tiny pom-poms glued on for tails, and pink noses dabbed on with Copic R20 to complete their cuteness! Easter weekend is only two weeks away ... are you ready? Thanks so much for joining me today! Happy Spring, Friends! The Spring rainy season has been here and now green is popping up everywhere ... I love it! To celebrate, I thought these adorable Memory Box Spring Bunnies would be appropriate! Aren't those bunnies adorable?!! I stamped them in Memento Gray Flannel ink, then colored them with Copic T0, T1, T2, and gave them rosy cheeks and pink ears with Copic R00 and R20. Next, I die cut Memory Box Blossom Circle from a green alcohol ink background paper I created with Copic Various Ink Refills and glued it in place around the bunnies. Next, I used Memory Box Broadsworth Floral Border to cut the card front right edge of my white top-folding card base. Then I glued a strip of pink alcohol ink background paper to the inside of the card, to make the delicate die cut edge pop. Note: (The alcohol ink backgrounds are from another one of my Copic Various Ink background making sessions << Full details can be found on that blog post. The green paper was made with YG03 and G46. The pink paper was created with Copic RV14 and RV17, with Gold Metallic Mixative added). To finish the card, I stamped the "happy spring" sentiment from the Spring Bunnies stamp set with Memento Rose Bud ink. I hope you are enjoying a nice Spring weekend wherever you are! Konnichiwa, Crafters! Today I'm over in Ellen Hutson's the CLASSroom to show you how I created the three different Copic Alcohol Ink backgrounds I used to create vibrant kimonos for these sweet Japanese women! The adorable "So Matcha" stamp set I used for this tutorial is brand new by Julie Ebersole for the next Essentials by Ellen release coming this Sunday, March 4! I hope you'll join me over in the CLASSroom!